Although we give awesome body massages, foot massages are what Treat Your Feet is most known for in the Atlanta area. Our name says it all. We know feet…at a scientific level! Our foot massages entail more than just a feel good rub. Foot reflexology techniques are involved. Foot reflexology is a type of massage which originated in ancient China or Egypt around 4000 B.C. In foot reflexology, pressure is purposely applied to reflex points in the feet to send signals to other targeted parts of the body. Each foot contains more than 7,200 nerve endings, 19 muscles, 26 bones, and 107 ligaments! Your feet are linked to every part in the human body. 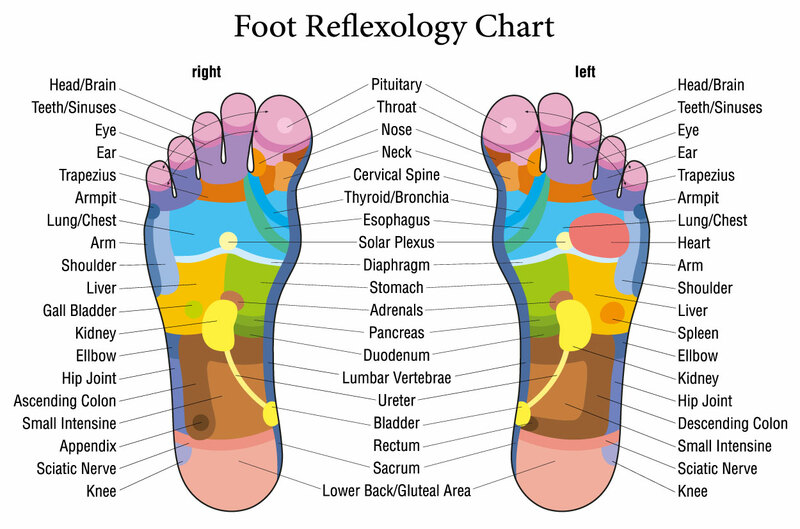 Take a look at the chart below to see which foot reflex point corresponds to which body part/organ. If you look at the diagram above, you’ll see that applying pressure to the insoles of both feet sends signals to the lumbar vertebrae and cervical spine. Applying pressure to the heel on both feet sends signals to the lower back and gluteal area. You’ll notice that the heart is linked to a reflex point on the right foot only. Our foot massage therapists know this diagram well. If done correctly, what can foot reflexology cure? It’s not uncommon for our foot massage therapists to even be able to induce labor in expectant mothers who are overdue. If you are pregnant though, please consider our prenatal massage. These benefits are multiplied when foot massages are done on a regular basis. If you work in a profession that requires you to be on your feet all day, then regular foot massages are what you need. Standing for extended hours will eventually take its toll on your health. Standing for long hours will eventually cause long term health problems such as nerve damage, inflammation, and chronic back pain. Many of our clientele have become believers in foot reflexology after just one massage. 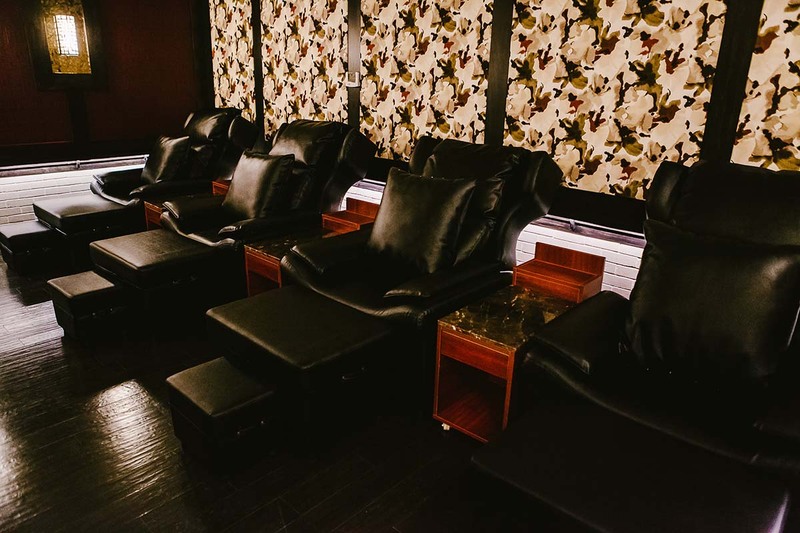 If you need a soothing environment to relax while having your feet massaged, then Treat Your Feet Buckhead is the perfect place. Shown above is a photo of our small foot massage room which seats 4 people. We also have a medium (seats 8 people) and large (seats 12 people) foot massage room. If you want to see photos of these foot massage rooms, check out our massage spa photo gallery. Our walls are soundproof and our doors can be opened and closed by pushing a button. Treat Your Feet Buckhead is located on the corner of Peachtree and Piedmont Rd in between Verizon and Orvis. Come experience the best foot massage in Atlanta. Our spa combines a soothing environment with top-notch massage therapy. In every one of our foot massages, we start your treatment with an exfoliating foot scrub, then use purely organic massage oils which leave your skin feeling soft and supple.